Click the button below to prepare for the PERT math placement test and skip remedial math! Our PERT math test prep course goes far beyond the typical practice questions you’ll find on the Florida Department of Education’s PERT website or in any other online program designed to prepare you for the PERT test. What these resources lack is the math instruction behind the questions, and that’s exactly what we bring to the table and what makes our program so effective. For example, we start every lesson with whiteboard videos. Then we move to guided practice with complete audio explanations. And finally we test your knowledge – but only when you have it completely down. Our “I do, we do, you do” approach is critical for anyone wondering how to pass the PERT placement test with a weak background in math. We know that the best PERT math test prep must be incredibly efficient as well. You want to be ready for the test, but you also want to get it over with as soon as possible! So, first and foremost, our instruction is direct and to the point. We won’t waste your time with long-winded explanations. Secondly, our PERT math prep only includes the topics that are covered on the test – nothing more and nothing less. And last but not least, every one of our lessons starts with a diagnostic pre-test to see if you already know the concept. If you do, you can skip the lesson. This allows you to move through the topics as quickly as possible. While it’s great if you’re able breeze through the course, many students need to take their time, and even go back to the basics if necessary. For these students, we provide convenient access to background lessons to build a strong foundation. This feature is particularly helpful for adults who are returning to school after a long absence and who may have forgotten the Algebra and Geometry they learned many years ago. Older students like these often have no idea how to pass the PERT math test, and the review provided by the background lessons is a true lifeline. Our PERT math help is also much more engaging than the old-fashioned standardized test prep you probably had to endure in the past. Not only do we use interactive multimedia to grab your attention and provide ongoing support, but we also have a dynamic grade report that tracks your progress and keeps you on task. 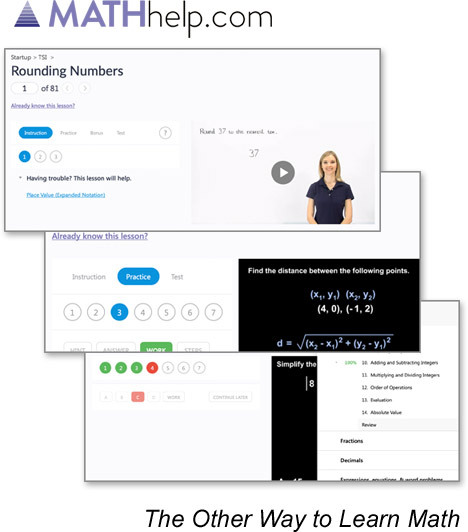 Finally, we provide a complete PERT math practice test, which you can take as many times as necessary because the questions will be different each time. In summary, you can think of our course as an PERT study guide that has everything you could possibly need to ace the test. Let’s face it. PERT practice questions aren’t enough, and classes and tutors are too expensive. That’s why we created our course – to offer the perfect balance of affordability and effectiveness that has always been missing for students preparing for the PERT test. Our lessons cover all the math on the test. Every lesson includes videos, guided practice, self-tests, and more. We offer detailed grade reporting and progress tracking to keep on task while completing your prep course!